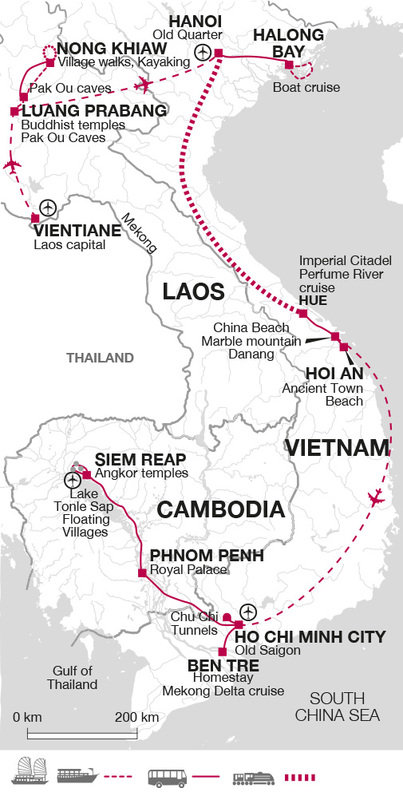 This comprehensive trip through Indochina takes us into Laos, Vietnam and Cambodia. We experience river life as we cruise to vast caves and beautiful waterfalls in Laos. In Vietnam we travel from north to south, discovering the jungle clad islands of Halong Bay, the old city of Hanoi and the Imperial citadel in Hue. Crossing into Cambodia we visit the incredible temple complex of Angkor. This morning is left free for further exploration of Luang Prabang. In the afternoon, we fly to Hanoi in Vietnam. This evening you can take a walk through the bustling streets and markets of the Old Quarter. The shops themselves have very narrow frontages, but are actually quite deep; they are known locally as 'tube' shops, while on the pavement food vendors sell noodles, snacks and stir-fries from shoulder panniers. We have some free time in Hanoi this morning perhaps to visit some of the many museums or Ho Chi Minh's austere mausoleum, which resembles Lenin's in Moscow. Afterwards we drive out towards the iconic Halong Bay in the Gulf of Tonkin. Thousands of jagged limestone islands rise out of the jade green waters like the hairy scales of a submerged dragon. In fact Halong means: 'Where the dragon descends to the sea'. As legend has it the rugged seascape was created by the pounding tail of a dragon as he ran from the mountains into the sea, carving the islands in his wake. This morning we enjoy the romantic scenery of Halong Bay on a cruise amongst the islands. We'll have the chance to stop at a grotto beneath towering cliffs and perhaps visit a beach. It is interesting to see the curious assortment of tourist boats, traditional junks and wooden sampans gliding through the waters. We enjoy a seafood lunch on board the boat, before returning to a hotel in Hanoi to freshen up before boarding the Reunification Express to Hué. We arrive in Hué, one of the great cultural and religious centres of Vietnam, a quietly impressive place. The Perfume River divides the city in two and has been the inspiration for poets and painters for many centuries. This afternoon we to take a trip by boat along the Perfume River from Hué to the Thien Mu Pagoda. This serene temple is the oldest in Hué and also the symbol of the city. This morning we appreciate Hué's fascinating history with a visit to the Imperial Citadel. Located on the left bank is the river, this palace was built by the Nguyen dynasty, Vietnam's ruling emperors from the early 1800s to 1945. The Citadel has formal moats and impressive ramparts that were constructed by 20,000 men and was a copy of the Forbidden City in Beijing. Although most of the inner part of the city was totally destroyed during the month-long Tet Offensive in 1968, the vast outer walls and the west wing remain an eloquent reminder of the palace's former glory. The remainder of the day is free to perhaps explore some of the outlying Tombs of the Emperors. We enjoy a scenic drive across the spectacular Col des Nuages, otherwise known as the Hai Van Passobserving rural scenes of thatched, wooden houses and lime-green rice paddies as well as enjoying panoramic sea views. Pausing in Danang, once the centre of the Kingdom of Champa (2nd century AD - 1720) we visit the Cham Museum, home to a fine collection of Cham sculptures. Our next stop is at the nearby five peaks of the Marble Mountains, said to represent the five elements of water, wood, fire, gold and earth. Naturally formed grottoes have been transformed into heavily carved Buddhist sanctuaries. A short distance from the mountains we find the white sands of My Khe Beach (nicknamed China Beach by American troops)- an ideal spot for a brief rest. Finally we reach our destination - the UNESCO World Heritage town of Hoi An. The historic, merchant town of Hoi An had become one of the busiest international trading ports of Southeast Asia by the 17th and 18th centuries. First colonised by the Portuguese in the 16th century it still retains its medieval charm today, with many of its old buildings superbly preserved. The day is free to explore at leisure. You may choose to visit the Japanese Bridge or some of the Chinese temples and meeting halls in the Old Town. There are many shops, bars and restaurants in this charming town and it is a great place to buy souvenirs, have clothing tailored or simply watch the world go by in a riverside café. You may wish to take an optional excursion out to the site of the My Lai village massacre memorial. The massacre was a significant turning point in the American War and the horrific story is told through a very emotive exhibition of photography. A further day is spent based in this lovely historic town. This morning we take an excursion to the holiest and most evocative of Vietnam's Cham sites, My Son. The Chams were dynastic lords who rejected the authority of China in 2AD and established their own kingdom. Although they benefited from strong sea links with the rest of Southeast Asia the kingdom's interior could not supply sufficient food for a strong military force. For 1000 years they managed to stave off attacks by the Vietnamese and Chinese, before being overcome by the Vietnamese in the 15th century. The track that leads to the site is slow and bumpy through wooded hills, but the site is certainly impressive with several groupings of Cham temples to be visited. Nowhere are the fine masonry skills of the Chams more evident than at My Son, despite the fact that much of the site was bombed in the 1960s. The afternoon is free to enjoy Hoi An further. The beach is only a short drive by taxi alternatively a boat trip on the river as the late afternoon sun lights up the riverfront is a treat. After a short drive to Danang Airport we fly to Ho Chi Minh City, from where we drive further south to Ben Tre in the Mekong Delta. Surrounded with lush and fertile land the area is home to small villages and swaying coconut palms. We take a local ferry to a nearby village, which we explore by trishaw. Later we board sampans, which are small Chinese wooden boats, and cruise along the narrow canals that shoot of the main vein of the Mekong River. After lunch at a local house we have some free time to explore the area further. Finally we return to Ben Tre by boat where we spend the night in a local homestay, with shared facilities and dorm-style accommodation. We spend the morning exploring the Nuoc Trong canal in the Mekong Delta, meeting some hard working locals, perhaps with time to see coconut processing and trading. We also have options to walk or cycle along the canal to explore further. Later on we drive back to Ho Chi Minh City. This morning we walk around the central sights of Old Saigon, now District 1 of Ho Chi Minh City. We see the Notre Dame Cathedral and the GPO building as well as some of the old French Colonial hotels such as The Rex. We then drive to the Independence Palace (renamed the Reunification Hall) and the graphic War Remnants Museum. The afternoon is free for you to explore the city further at your leisure, perhaps with a visit to the huge Ben Thanh market. This morning we take a short drive out of the city to the infamous Cu Chi Tunnels, which formed an incredible underground command base for 10,000 Viet Cong troops and were a major part of the 1968 Tet Offensive. The site is a fascinating insight into the resourcefulness of the Vietnamese. There is the opportunity to crawl through a small specially adapted section of the tunnels should you wish to sample the claustrophobic conditions in which the Viet Cong lived. Afterwards we bid farewell to our tour leader who continues back to Ho Chi Minh City while you continue by road into Cambodia. Border formalities take place at Moc Bai (Vietnam) and Bavet (Cambodia) crossing point. Our final destination is Phnom Penh, Cambodia's capital. From December through to February warmer clothing is needed for the North. Days are hot and humid. Lightweight rainwear essential at all times.The northern region is cold at night during the winter. One main lockable bag/case, an overnight bag for your trips to Halong Bay and the Mekong delta when your main luggage is left behind and a daypack. Please remember that you are expected to carry your own luggage so don't overload yourself. Even though bed linen is provided on the train journey, you may want to bring your own sleeping sheet (it can be purchased in Hanoi); torch, and don't forget mosquito repellent (no need for a mosquito net as when necessary, it is provided). Accordingly, you should allow US$ 70. Cambodia: A single visa is required by UK, New Zealand, Australian, USA & Canadian citizens and can be obtained on arrival. The current cost is 30 USD, a passport sized photograph for immigration will also be required. Alternatively, you can arrange your visa in advance in the form of an e-Visa. To make your application, and for more information contact the Cambodian Ministry of Foreign Affair's direct at www.mfaic.gov.kh. This four week trip is ideal for travellers with extended holiday time who want to see the highlights of the Indochina region. This trip takes you through Laos, Vietnam and Cambodia showcasing the best of each diverse destination along the way. Ideal for lovers of history and culture this adventure holiday will give you a great insight into the regions turbulent past and a flavour for how different each country is, while endeavouring to experience local life along the way.